← Cookie Lover’s Chocolate Bark in a Heart … Giveaway, too! 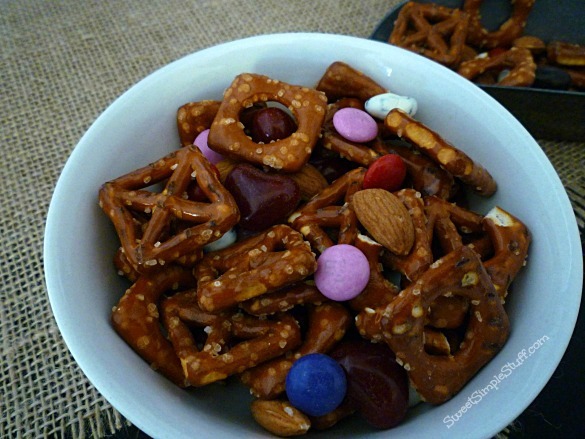 Those pretzels worked perfectly … just had to open the bag and add some other goodies! Candies and yogurt covered raisins added the Valentine’s Day colors! 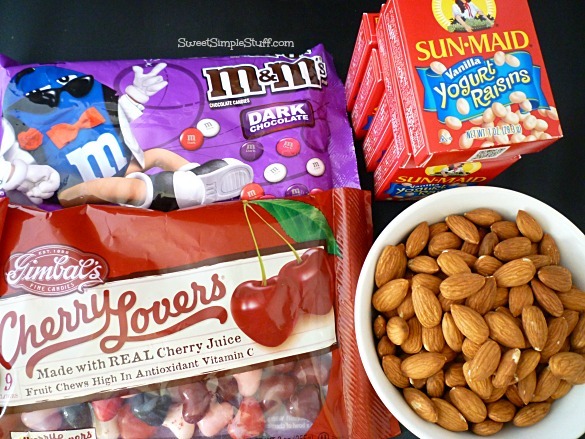 The flavor combo of salty pretzels, raisins, almonds, dark chocolate and cherry was a winner! 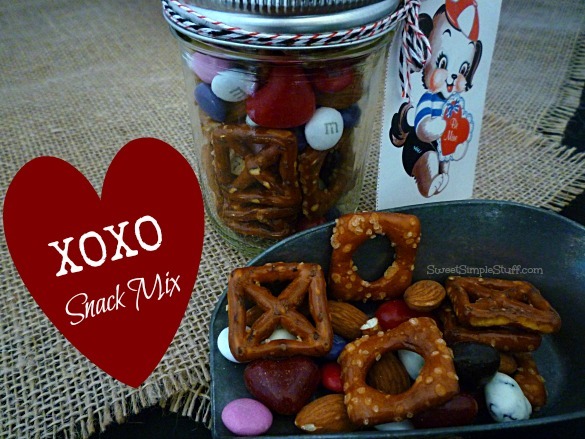 Scoop some mix into a jar and add a Valentine card to make a cute little gift for someone! Make treats for the classroom by using cello bags and adding a printable tag … found some cute ones here. To the best of my knowledge, Market Pantry is a Target brand and that is only place to buy these pretzels. If you know of any other sources … please share. 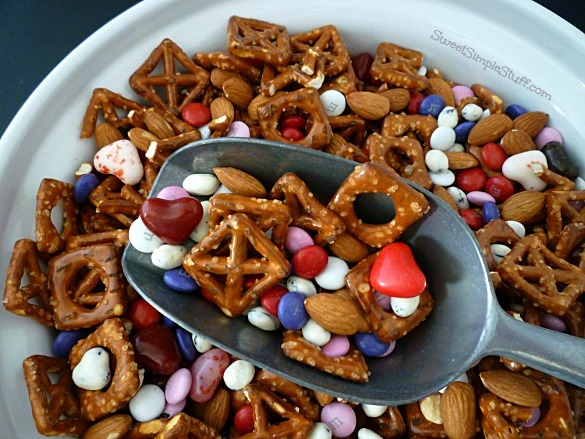 Pour all ingredients except pretzels in a medium bowl and stir to combine. 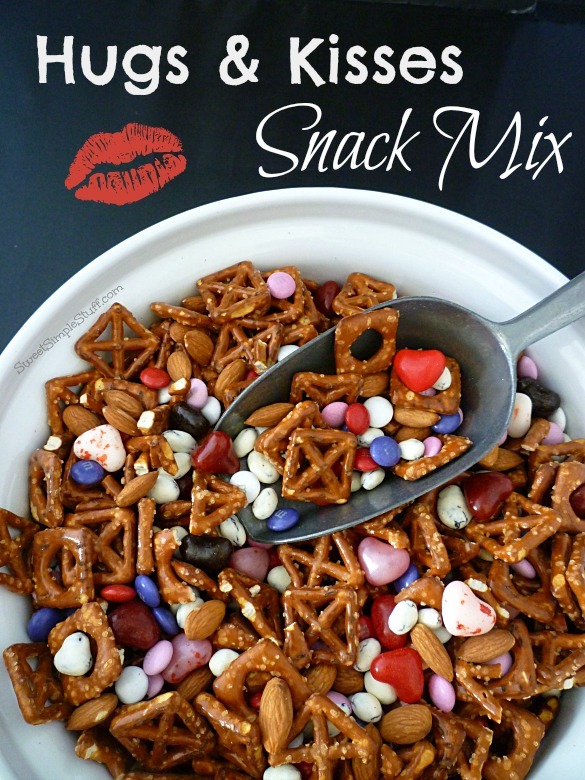 Use a very large bowl and layer pretzels, candy mix, pretzels, candy … repeat until everything is combined. 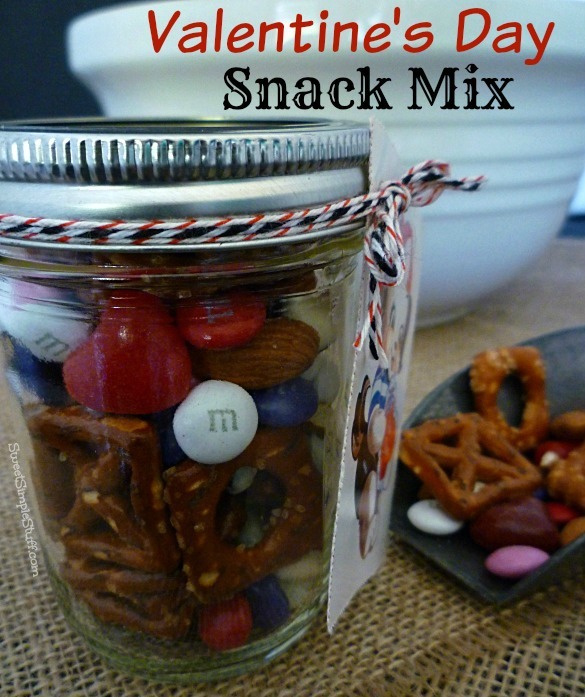 Scoop into bowls, jars or bags and give to your Valentine ♥ Note: the candies have a tendency to sink to the bottom of the bowl, just give the snack mix a stir! P.S. There is still time to enter the Heart Pan Giveaway … be sure to check out the comments … you won’t believe what some people have done with cake pans! 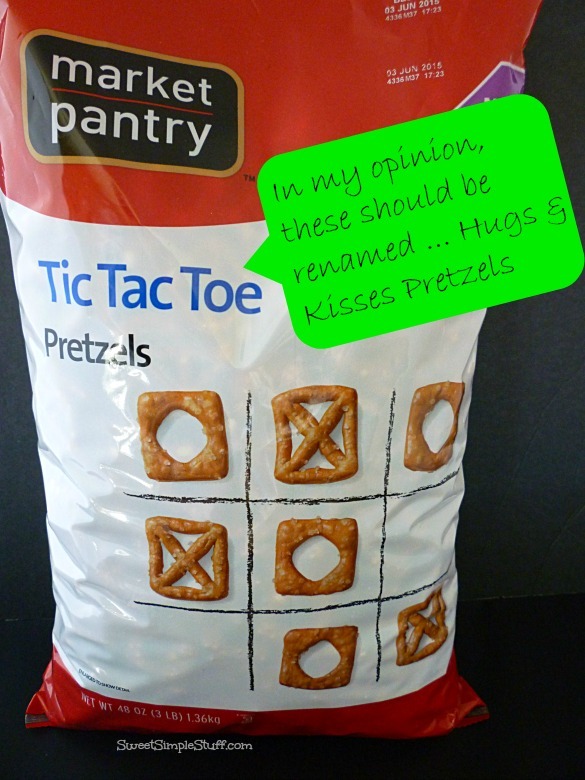 Those X & O pretzels are perfect for Valentines Day – thanks for the tip off on where to buy them. Target has stuff other stores just don’t carry so it’s one of the first places I stop when looking for the unusual. Now see that it’s their store brand – Market Pantry – ah ha. World News said Target just closed all 133 (?) of their stores in Canada so we’ll keep our fingers crossed that they remain in the US. Oh yes – I can imagine you’re going to come up with even more delish ideas for the Xs and Os. Perfect for Valentines day or even for one’s lover on his or her birthday . What a cute little item to give to my 9 grandkids. That is providing all I don’t eat all the yogurt covered raisins before hand. Love the X & O’s! They are perfect for this! Thanks for sharing! Too funny Lisa 😉 Those sneaky little pretzels called my name, too! I will say that it’s one of my best purchases recently.